Maureen Paley is pleased to present the second solo exhibition by David Salle at the gallery. Salle lives and works in Brooklyn, New York and is known for the crucial role his work played in the discussions around postmodernism in contemporary art. Taught by John Baldessari in the 70's at UCLA he is considered part of the Pictures Generation whose work was revisited in an exhibition of the same name at the Metropolitan Museum of Art, New York in 2009. Salle's subject matter and pictorial language stem from his interest and engagement in performance and his exploration into the relations between painting and cinema. His large format paintings often layer a variety of culturally specific images, words and objects with provocative elements. More recently the bodies of painted studio models are used as brushes to introduce new modes of abstraction and figuration into the work. Maureen Paley has previously exhibited some of Salle's early photographic works from the mid 80's alongside his canvases. The new exhibition will also feature collages and drawings that incorporate vintage printed matter from Salle's studio archive along with images he has generated that have not been seen or used in this way before. At the center of the new exhibition is a large painting of the American West titled Trappers (2014). The black and white underlying image is a re-painting of a scene by George Caleb Bingham, one of the most popular American painters of the mid 1800s. Bingham's paintings were extremely theatrical and would be set up in tents where admission was charged in order to view them. Although carefully plotted, the composition of Salle' painting is also subject to chance as Salle introduces brightly coloured body prints that are made by literally dragging a model across the painting's surface. His aim is always to keep the eye moving across and around the space of the painting and in Trappers the actual movements begin to translate into metaphorical ones. âThere is something compelling about the fur trappers gliding along the grey water, with the silhouette of a black cat improbably stationed in the bow of the narrow canoe. The trapper's faces, party obscured by the body prints skidding across the surface of the painting, have a pensive, solitary feeling about them. Their little craft looks to be more at home on the River Styx than the Missouriâ¦ â¦ I am interested in the combination of the two elements - the differences in scale, palette, and modeling - the overlay of one on top of the other - and also how one group of âactors' creates an image of movement from illusionistic devices such as perspective while the other group (in the studio) makes an image from a literal âaction'. The scale, the looseness, the sense of freedom and audacity - as well as the river scene itself, all combine to make this a painting that addresses the idea of the American West as the locus, or container onto which was projected the ideals of agency and self-sufficiency within nature.' 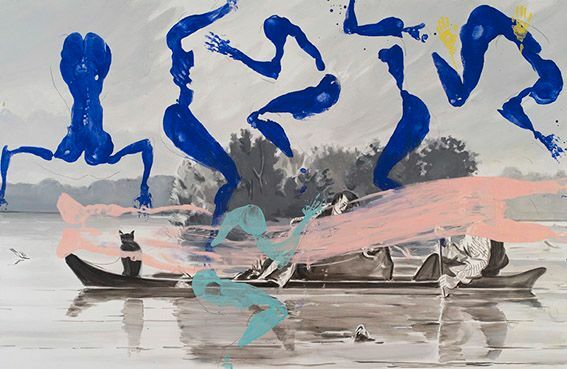 David Salle, 2014 Recent solo exhibitions: David Salle: Ghost Paintings, The Arts Club of Chicago and then at Skarstedt Gallery, New York, 2013 featuring 14 works made in 1992, curated by The Arts Club of Chicago Director Janine Mileaf. The exhibition was accompanied by a fully illustrated catalogue, which includes a discussion between the artist and Hal Foster, an essay by Janine Mileaf and documentation of Salle's early performance work. TAPESTRIES / BATTLES / ALLEGORIES, Lever House Art Collection, New York, 2012 From 1975 solo exhibitions include: ¬The Kitchen, New York; Museum of Contemporary Art, Chicago; Institute of Contemporary Art; Philadelphia; The Whitney Museum of American Art, New York; The Museum of Contemporary Art, Los Angeles; Art Gallery of Ontario, Toronto; The Menil Collection, Houston; Staatsgalerie Moderner Kunst, Munich; Tel Aviv Museum of Art, Tel Aviv; Stedelijk Museum, Amsterdam; Guggenheim Museum, Bilbao; and Kestnergesellschaft, Hannover. His works are in the collections of numerous museums including the Art Institute of Chicago; The Solomon R. Guggenheim Museum, New York; LACMA, Los Angeles; MCA Chicago; The Museum of Modern Art, New York; Nationalgalerie, Berlin; The National Gallery, Washington, D.C.; Stedelijk Museum, Amsterdam; Centre Pompidou, Paris; Tate Gallery, London; and the Whitney Museum of American Art, New York.